Models starting with a 7 are stainless guns. 738P (38Sp +P) – also referred to as the Lil’ Dan. 414 (414 Supermag) – Blued prototypes from Monson and Palmer known to exist along with a blued Norwich gun. During the Palmer manufacture period (Wesson Firearms Co., Inc) there were some single action only 22 caliber target guns manufactured . These models were only manufactured in blue or stainless with 10″ barrel assemblies, either vent or vent heavy. The single action only guns were designated with a 6 before the model number. 622-V10 Blue, single action only 22 cal. 622-VH10 Blue, single action only 22 cal. 6722-V10 stainless, single action only 22 cal. 6722VH10 stainless, single action only 22 cal. 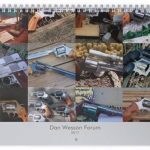 Because of the Dan Wesson interchangeable barrel system, when the guns were sold, the barrel size and type was usually part of the model designation. 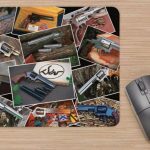 Obviously this would change if the user changed the barrel, but it is still an interesting part of the Dan Wesson equation. 1). 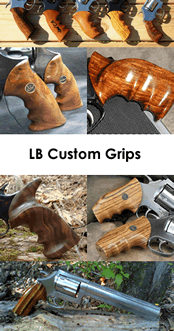 Standard barrels having the solid rib without the heavy underlug were usually designated by the barrel length alone. For example, as per the information posted above, a 357 magnum with adjustable sights is a model 15. 2). Barrels with the vent rib get a V prefix. 4). The slots cut on some of the silhouette shrouds add an S to the end. Also note the barrel length is the actual length of the barrel, from the forcing cone to the muzzle crown. The shroud length is obviously less because of the area the barrel screws through the frame. The Pistol Pac and Hunters Pac. 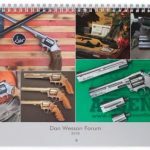 From very early on, the Dan Wesson Revolver has been offered as a Pistol Pac. Over the years, the contents of the Pistol Pac changed some, but most contained the following Items. 1.) 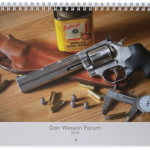 Dan Wesson Revolver with an 8″ barrel assembly. 2.) 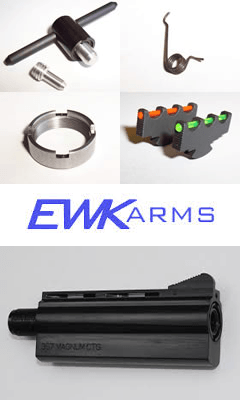 Extra barrel assemblies in 2 1/2″, 4″ , and 6″ length. 1). Dan Wesson Revolver with an 8″ Vent Heavy Shroud. 2). A Vent 8″ Shroud (only, no extra barrel), equipped with Burris scope mounts and a Burris scope in either 11/2x-4x variable or 2x fixed. Hunters Pacs were identified by an “HP” before the model number and then a “V” for variable scope or a “2” for fixed power scope. HP744-2 = 44 magnum stainless with 2x fixed scope. The most common small frame guns are the model 15 and 15-2, the thought is the -2 guns have minor differences when Monson started manufacturing the guns and labeled it the -2. One of the changes noted is shape of the hammer. 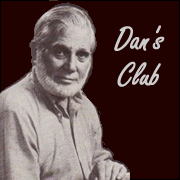 When Bob Serva bought the Dan Wesson company and moved it to Norwich NY, he retooled the shop with all new CNC machines and the first guns he produced were marked “First issue” they went back to labeling the model 15 and 715 dropping the -2. There is also a SuperRam Silhouette version available in many calibers, Norwich production with an under cut patridge front sight covered with a slab-sided hood, the rear sight is a Bomar with 18 clicks per revolution. These guns are marked with a SRS-1 on the barrel hood. The Model 11 service and the model 12 target both had the pork chop barrel shrouds and the exposed barrel nut on the end. The early Model 14 and 15 had the pork chop barrel shrouds, but the barrel nut was recessed. The pork chop shroud was redesigned to the current style when the model designation was changed to 14-2 and 15-2. The stainless 38 Special Action Cup with the large slab barrel shroud was just designated as the “Action Cup”, no numerical model number.